Trying to look up the origin of food (any food) can be interesting and intriguing. A good example would be this dolmade. Some literature says its Greek, some says its Persian or Middle Eastern or Balkan regions or Caucasus region or even Central Asia. In my humble opinion, whatever name its called, no matter where its from, with the help of internet, the distance between us has become a mere click away. My first experience of eating dolmades was this once (ie after photoshoot)! I have seen dolmades sold in the deli section of Woollies. Needless to say that I was curious, very curious! I remembered asking the person behind the counter about it and what's in it. One last question didn't make it passed my lips, "Do you eat it.... everything? even the leaf?" ...this is my first time making dolmade. I used fresh grape leaves, courtesy of a friend who was moving away from Perth :(. 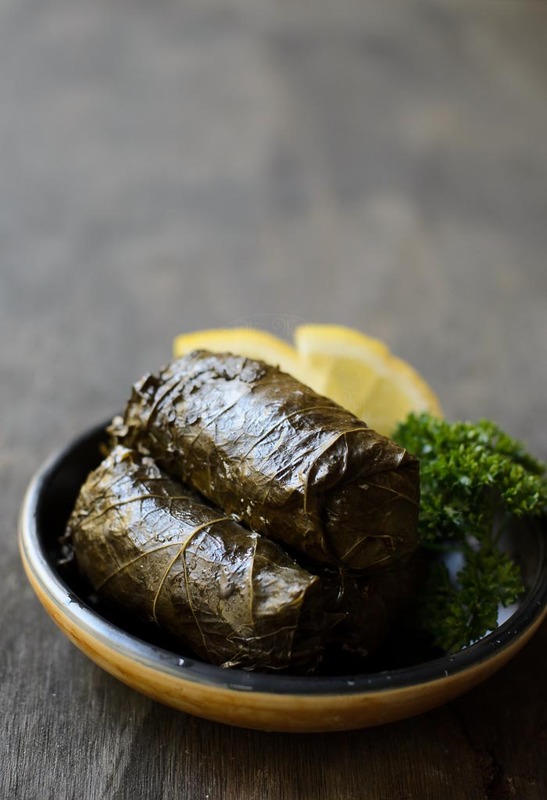 Vegetarian Dolmades. Grape leaves stuffed with rice and olives. Wash and clean the grape leaves. Add water or chicken stock. Stir until rice absorb all water. Add chopped olives, lemon juice and season with salt and pepper. Arrange Dolmade in a shallow pan (best use frying pan). Add water or chicken stock to just cover the dolmades. cover and let it simmer for 30-40 minutes or until all water has been absorb. Leave it to cool and serve with lemon.